This beautifully presented, well established Agency in a busy prestige Village style shopping centre. Excellent Lease Tenure - 5 years x 5 year option - High retail sales and strong Tatts Agency. Adjusted Net Income $165K plus for owner operator. Finance available to approved purchasers. Long Lease enables easy repayments. VIBRANT POPULAR SEASIDE LOCATION ! This Apollo Bay Newsagency- Tatts business is in the heart of this vibrant seaside town. Perfect for sea-changers or anyone who wants to have a great lifestyle with an excellent income. This business is ripe and ready to go with a new Tatts fitout, homewares, gifts, toys, souvenirs, art and books. Opportunities abound for further expansion in this flourishing tourism market. Be quick to take advantage of the summer holidays peak season income. $330,000 PLUS SAV - Finance available to approved purchasers. Excellent Opportunity for a single operator in this Lotto and Newsagency business. Large shop of 70 sq. metres price include latest Tatts shop fit. The shop is well patronised by the locals in this village like atmosphere. The current services included are: Tattslotto, Newspapers, Magazines, Phone cards – All types, Stationery, Greeting Cards & Wrap, Toys, Photocopying, Fax, Gift Cards, Confectionary, Giftware etc. A new owner can expect can expect an adjusted profit of $2K per week. This modern Post office is situated in prime location close to station in busy shop strip. Brand New shop fit. Long lease Cheap rent Re developing area with high growth prospects. Services include Full range of Australia Post products and services, MYKI Ladbrokes, Cards stationery, magazine and newspapers dry cleaning etc Ideal for a single operator couple looking for a secure income with nothing to spend. Adjusted Net Profit $180K for owner operators. Beautifully presented business - Tatts New Fitout completed. Situated in a busy Community Shopping Centre. Ideal for couple with minimal part-time help - long term Vendors retiring. Thriving Tatts Agency , Subnews and Tobacconist Business. First time offered for many years. Easily operated by couple with part- time help on Saturdays and jackpot days. Situated in a prestige area, servicing the local community which has been steadily growing with new housing developments in the area.is close to the major supermarket , has ample car parking facilities. Adjusted net Income for couple after all expenses $200k plus per annum and increasing substantially. This business represents an excellent opportunity for somebody new to the Tattersalls Industry to get their foot in, or for the savvy operator who wants to take advantage of the well established, consistent foot traffic, and loyal customer base. The business is well presented and has been operating from current address for over 30 years. The only Newsagency and Tattersall’s agency in local vicinity. No Deliveries - 6 day business. One of Victoria's premier Historic townships with a growing population and a very strong number of growth in tourism. Most weekends of the year the local population of 1500 swells to around 3000 and greater for their festivals. The current owners have been in the business 20 years and are now looking to retire. The shop is well presented and has the latest Tatts shop fit and is a monopoly business in the town. This is an ideal business for a couple or family to enjoy all the benefits of a country lifestyle but only 1.25 hrs to Melbourne, 15 minutes to Castlemaine and 25 minutes to Bendigo. The rent and lease is very reasonable. This business offers both great lifestyle opportunity and excellent profits ! 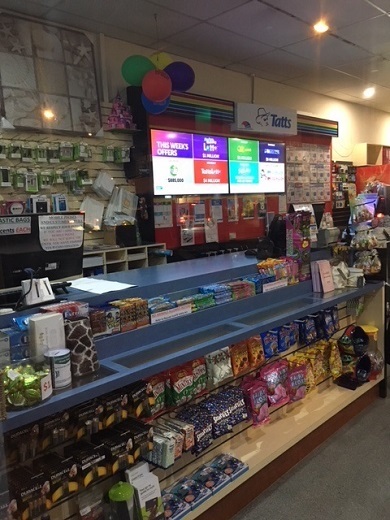 "Excellent Opportunity" for a couple to relocate and enjoy a Change Of Lifestyle at this Costal Gem in this top performing Newsagency business. Located in the main street of Portland in a large retail shop is this Monopoly business that is well patronised by the local community and surrounding district. The current services included are: Newspapers, Magazines, Stationery, Greeting Cards & Wrap, Photocopying, Fax, Gift Cards, Confectionary, Giftware etc. This business turns over in excess of $113,500 per month and a full time working couple can expect an adjusted profit of $200K per year after expenses. A long lease is being offered with a rent of $350 per week.